When I was 10-years-old, my parents finally got me a dog. Spike changed my life in an instant. I was in charge of walking, feeding, training, and bathing him – and I adored every second of it! Not only did the experience reinforce my passion for dogs, it taught me empathy, responsibility and unconditional love. Dogs do so much more for developing young minds than just provide a waste receptacle for unwanted broccoli. They have countless lessons to teach, moments to enhance, and health benefits to share. 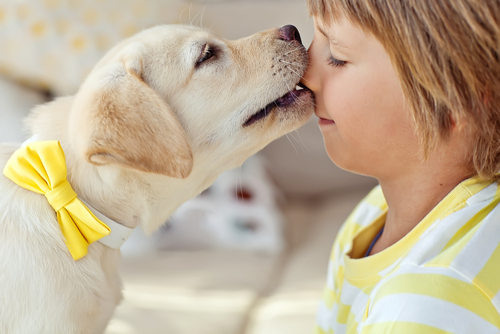 Here are 9 reasons every kid should grow up with a dog! 1. Babies who live with dogs get sick less. Researchers at Kuopio University Hospital in Finland conducted a study of nearly 400 infants born during a two-and-a-half year period. They found that during their first year of life, babies who lived with dogs experienced fewer illnesses, shorter bouts of ear and respiratory infections, and were less likely to need antibiotics than infants from pet-free homes. The team theorized that dirt and germs brought in by the family dog caused the babies’ immune systems to mature more rapidly, making them better prepared to fight off viruses and bacteria that cause respiratory problems. It is now referred to as the “hygiene hypothesis,” and its validity is widely accepted in the scientific and pediatric communities. 2. Growing up with a dog may prevent allergies. Another study conducted by the Department of Pediatrics at the University of Wisconsin found that infants exposed to dogs – especially around the time of birth – were about 50% less likely to develop certain allergic diseases. As with the Finnish study, the researchers suspect that early exposure to pet-related allergens and bacteria strengthens the immune system and prepares it to fight off future attacks. The key seems to be exposing babies to dogs immediately after birth – kids who got a pup after one year of age did not enjoy the same health benefits. 3. Kids with dogs get more exercise. With childhood obesity rates and incidences of Type II Diabetes soaring, exercise is more important than ever. However, it can be difficult to get kids to go outside and play when the lure of their electronic devices is so strong. 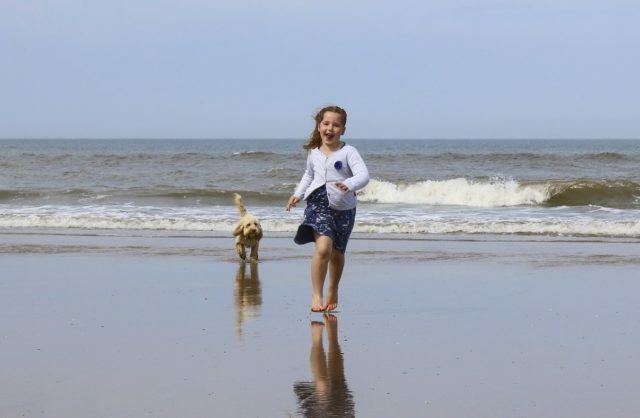 A study published in the American Journal of Public Health, found that children with dogs spend 11 more minutes per day engaged in physical activity than those without dogs. While this might not sound all that significant, pup-owning kids were also found to spend 11 minutes less in sedentary behaviors each day, and take 360 more steps than the dogless children.